I do not particularly enjoy sewing clothes and would not have even attempted to sew an Elsa dress for my daughter this year if it wasn't impossible to find a decent dress for less than a zillion dollars. 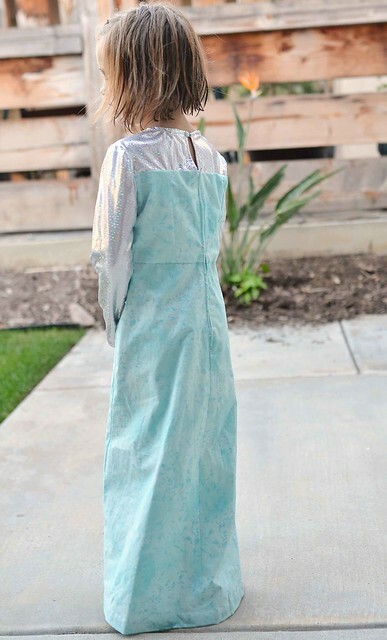 But they are in short supply and my daughter really wanted to be Elsa, so I thought I'd give a go. I found the McCall M7000 official looking pattern and took my daughter to pick out fabrics. And then they sat there for a long time because I really didn't want to make the dress, but a couple weeks before our first Halloween party I decided I should get started. This isn't really a difficult pattern, but it is probably the hardest pattern that I have made. Especially because the sparkly, stretchy knit (?) that I used for the sleeves was really obnoxious to sew with. I decided not to make the overlay because it seemed like it would get in the way when she wore the dress to school, but I otherwise followed the pattern. My daughter is 6 and a half so I made the 5-6 size even though her measurements were in the size 3-4 range. It is a little bit big, but I am glad I made the bigger size because I am never, ever making another one. Even though it's not perfect and I am only buying Halloween costumes from now on, my daughter was very excited about the dress so I guess it was worth it. I had to smile at this post. You sound just like me - too much hassle and much easier to buy costumes. Wait until she needs a prom dress and thinks you can whip up something from a sketch or picture on the internet. I don't have a daughter so I don't have these issues, though I did once have to make my son 'something African' to wear to school for some reason. LOL, I was wondering who Elsa was until I read Jo Jo's comment. Guess you can tell I don't have children. Still, I sympathize with your plight. Anything I wear that needs to be shortened, taken in, let out, etc. goes straight to a wonderful seamstress where I live. Unfortunately, I couldn't convince her to make a garment from scratch for me. Your daughter looks very cute in her dress and very pleased. Good job! I feel your pain. I am in the process of making Elsa too. I wish i had purchased cotton instead of crepe, because I am having a terrible time keeping it from sliding around. I do not look forward to sewing the shiny tulle like overlay! You did a great job! When my daughter loves something I make, it really makes the headaches worth it. I love this post...and understand completely! That shiny Halloween fabric is horrible to sew with. I completed a costume using it too. I won't use it again either. She looks adorable! I am making the same dress for my 5 year old, same pattern. I have been procrastinating because I hate sewing this sort of thing! Satin is the worst. I would have bought the costume but they didn't have her size anywhere here... The things we do for our kids! You did a beautiful job with it! And I'm sure she'll wear it as long as it fits! Well, despite the PIA factor ;) it turned out great! And I bet she LOVES it! Every Halloween I question why I make costumes...until I see the smiles on their faces. 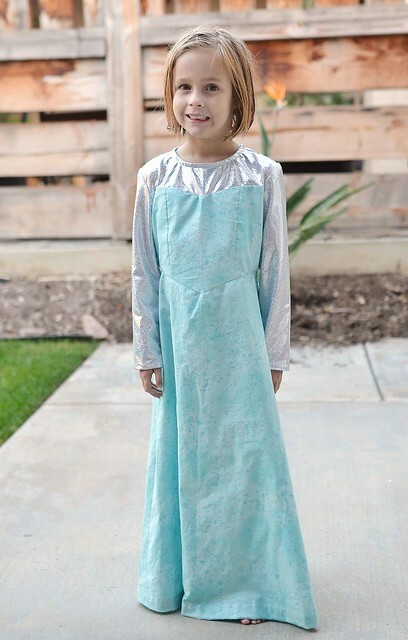 And oy, the Elsa dress...sometime I'll have to tell you all about our Elsa dress debacle. You sound like me when it comes to clothes. Somehow I lucked out and my MIL sews all their Halloween costumes. Of course, I get no credit for how they look on Halloween though =) This year, you do! Here's to purchased or gifted costumes in our futures! I tell you from experience, your kids look back on the costume you made with a lot of love. And you did a fantastic job!!! Very sweet, and I love her little haircut! Lol! I made my daughter's first costume when she was almost 2--a pirate. It took about 36 hours of sewing (I'd never sewn a garment before) and I was able to miraculously make puffy sleeves! Some of it I had no idea what the directions were telling me to do, so I winged it and I turned out okay. I've only made in either costume since then. It's not worth the time or hassle for me. Is rather be quilting! Your daughter looks adorable in her dress...great job!!! !